The fiftieth anniversary of the opening of the Second Vatican Council fell two years ago in October 2012. In December next year it will be the fiftieth anniversary of the end of the Council. There is bound to be much discussion in the coming months of the meaning and significance of the Council, its failures, its successes, its misinterpretations, its distortion and exaggerations, its key seminal texts, and its future developments. Blessed John Henry Newman has often been referred to as ‘the Father of the Second Vatican Council’. Although Newman was certainly inspirational for the theologians who were the architects of the Council’s teachings, many of which he had anticipated in the previous century, there is only one place in the conciliar documents where his direct influence can clearly be discerned, the text in the Constitution on Divine Revelation which speaks of the development of doctrine. Even so, in this most seminal of modern theologians, the theologians of the ‘ressourcement’ found a sympathetic and eloquent precursor. The ‘ressourcement’ was a theological school that sought to retrieve the sources of Christianity in the the Scriptures and the Fathers and was anxious to escape from the dead hand of a desiccated neo-scholasticism which had lost touch with the Fathers. 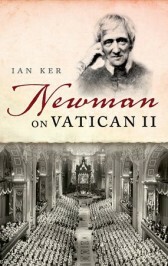 Newman has often suffered from selective quotation by people on the opposing wings of the Catholic Church who seek to present him as either a liberal and progressive or as a highly conservative and even reactionary thinker. But the truth is that Newman must be seen in the full range of his thought. For Newman was neither simply conservative nor liberal but is best described as a conservative radical, always open to new ideas and developments but also always sensitive to the tradition and teachings of the Church. “To live is to change, and to be perfect is to have changed often.” JH Newman, 1801-1890, by Babouba, Ng556. CC BY-SA 3.0 via Wikimedia Commons. As an Anglican, his radicalism disconcerted and dismayed conservative high churchmen. As a Catholic, he disappointed the liberals because of his respect for authority. He also angered the Ultramontanes with his openness to change and reform. In his Apologia pro Vita sua, Newman was anxious to show, in effect in accordance with his theory of doctrinal development, that his development from a simple Bible Protestantism to Roman Catholicism represented, change but change in continuity – authentic development rather than corruption. The famous seven ‘tests’ or ‘notes’ of true development that he set out in his Essay on the Development of Christian Doctrine have frequently been dismissed but they can be shown to be applicable to the history of his own religious development. And they are valuable in showing how the most controversial of the documents of Vatican II, the Declaration on Religious Freedom, can appear to be an abrupt change in the Church’s teaching and yet be actually an authentic development in continuity rather than discontinuity with previous teaching. In his private letters before, during, after the First Vatican Council, Newman adumbrated a mini-theology of Councils. He was particularly interested in the connexion between Councils and how one Council modifies by adding to what a previous Council taught, and how Councils evince both change and continuity. He saw how Councils cause great confusion and controversy, not least because their teachings, which require careful interpretation, are liable to be exaggerated by opposing protagonists, and that they can have very serious unintended effects. He was also struck by the significance of what a Council does not say. Vatican procession, by Franklin McMahon. CC BY-SA 3.0 via Wikimedia Commons. Vatican II’s silence on evangelization is a striking example of this. However, the understanding of the Church as fundamentally the organic communion of the baptized, with which its Constitution on the Church begins, has been concretely realized in the new ecclesial communities and movements. These constitute not only a clear response to this silence but also exemplify Newman’s point in the Essay on the Development of Christian Doctrine that such an idea becomes clearer in the course of time. The first two chapters of the Constitution, which is the centrepiece of a Council almost entirely occupied with the Church, emphasise the charismatic dimension of the Church, the importance of which Newman understood very well as both an Anglican and Catholic. He himself was not only the leader of the Oxford Movement but also the founder of the Oratory of St. Philip Neri in England, which he knew had originally begun as in effect an ecclesial community before it became to be virtually a clerical congregation. The writings of Newman that anticipate the documents of Vatican II provide a valuable and corrective hermeneutic for the understanding of the conciliar documents that have been frequently distorted by exaggerations and partial interpretations. They illustrate how Newman was both the radical reformer and the traditional conservative. The so-called ‘new evangelization’ of secularized post-Christians was also anticipated by Newman in his little read Catholic novel Callista, which in fact dramatizes the approach of an earlier Anglican sermon. What is particularly striking is that his famous argument from conscience for the existence of God is not the primary apologetic approach that he advocates. Ian Ker has taught both English Literature and Theology in universities in the United States and Britain, where he currently teaches in the Theology faculty of the University of Oxford. He is generally regarded as the leading authority on Newman, on whom he has written and edited more than 20 books. He is the author of John Henry Newman: A Biography (1988), The Catholic Revival in English Literature, 1845-1961 (2003), G. K. Chesterton: A Biography (2011), and Newman on Vatican II (2014).